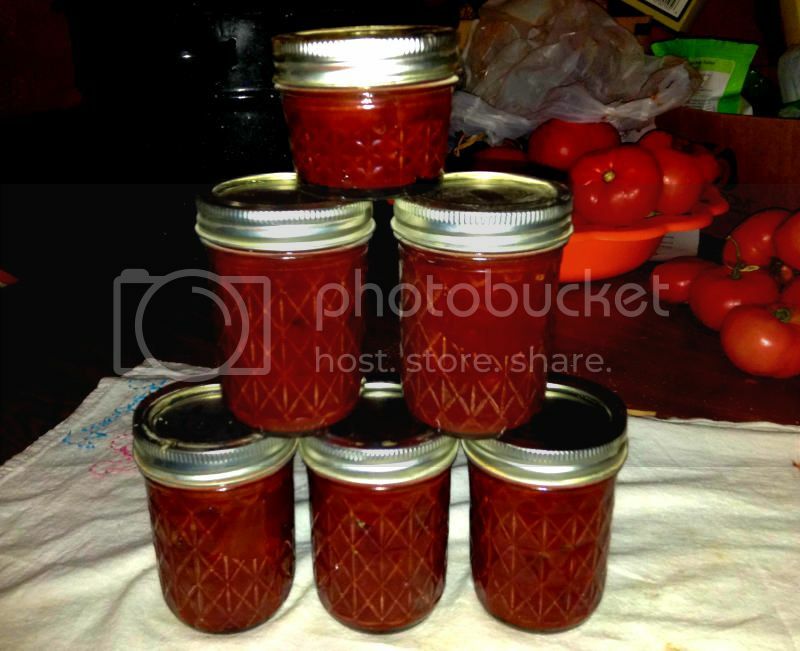 If you are a frequent visitor to this cooking site, you have surely come across multiple posts in which I am grumbling about the difficulty of finding plum jam in the United States. 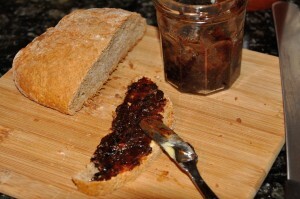 Plum jam (slivkový lekvár) is an essential ingredient in Slovak cuisine. It’s thick and does not run, which makes it the ideal filling for koláče, buchty, sweet pierogi, or jam turnovers. There is also a popular dish made with whole plumes, plum dumplings. Long story short, I decided try making my own plum jam. The difficulty is that I couldn’t actually find fresh plums. I started this project in December, long after the plum season ended. On top of that, the plums that can be found in my local grocery stores are the big red kinds, not the small blue Damson plums used in Slovakia. However, I noticed that the plums on the cover photo of the package of D’Noir prunes looked very much right! 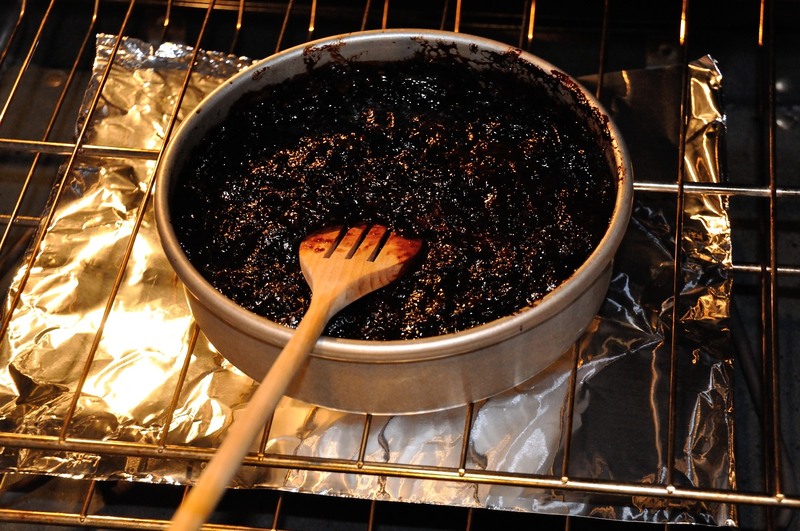 So I figured, perhaps I could try making jam from prunes – which are basically just dehydrated plums. 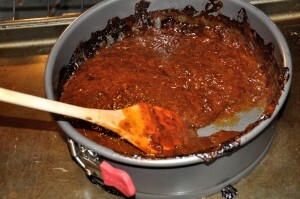 The end result was quite satisfactory, although the color of the jam ended up more brown than blue. Below you will find the recipe. 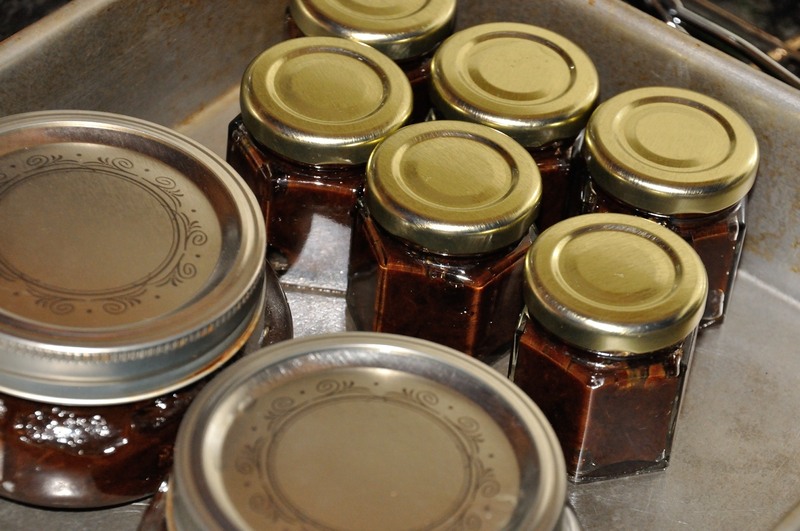 As you will see, making your own plum jam is actually quite easy. This post is actually the result of three different tries. They all started with the same ingredients but there were differences in the processing. 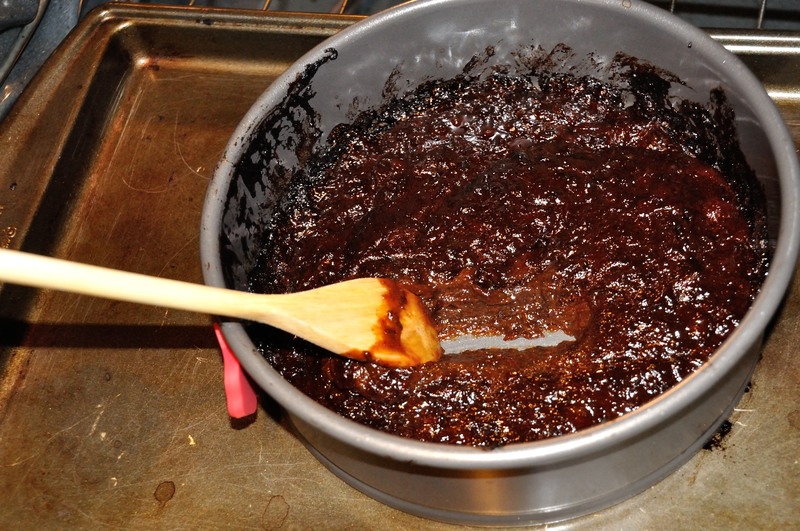 The first try, for which I don’t have any pictures, was made in a pot by cooking the jam. This is a little bit messy and time consuming. 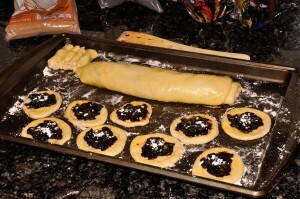 I later stumbled upon a recipe on a Slovak recipe site calling for the jam to be baked (pečený). This actually makes perfect sense. On the stove top, the heat is delivered from one end only. 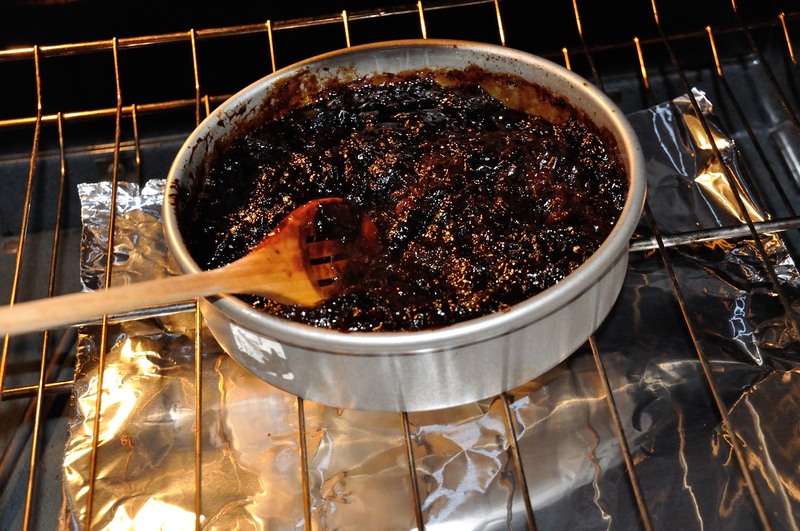 Unless you continuously stir the jam, it becomes quite easy to burn it. 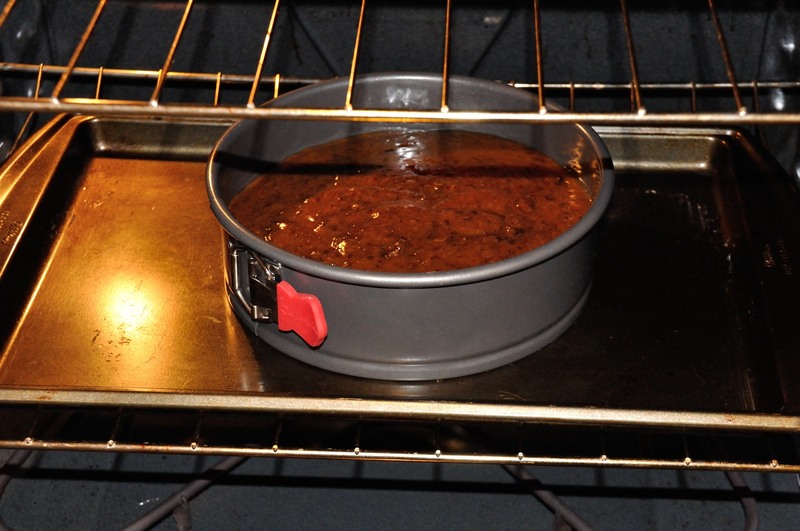 On the other hand, the oven gives you a nice uniform heating from all sides. Brilliant! 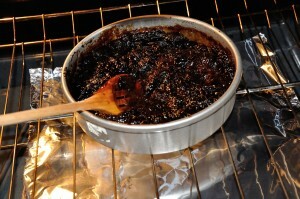 The issue with the first jam was that it was quite thin – I didn’t cook it long enough. I used the baking method in try #2. 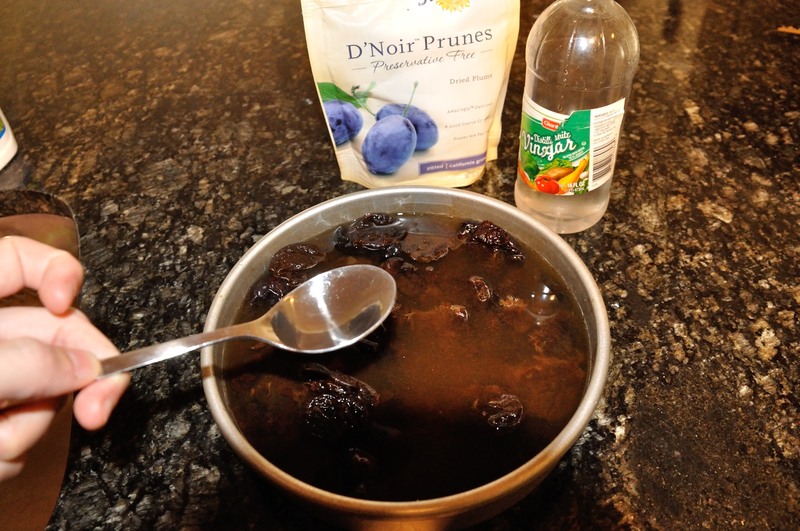 If using prunes, let them first soak in water overnight. I then added one tablespoon of vinegar and a shot of rum, for taste. I also added about two heaping tablespoons of brown sugar. 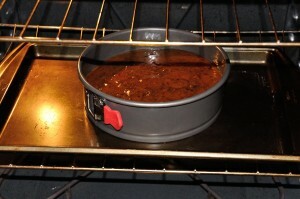 Next place the pan in the oven preheated to 390F. Wait for the jam to come to a boil and then lower the temperature to about 350F to maintain boiling. Stir the jam about once per hour. 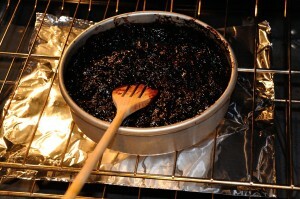 It will take about 3 to 4 hours for the jam to sufficiently thicken. I actually let this jam bake too long (about 5 hours) and it ended up being too thick for spreading on bread. However, it was fine as a sweets filling, so I used it to make some kolache and buchty. I also made a poppy seed roll. The other issue with #2 and also #1 was that since I used whole prunes with the skins intact, the jam was not particularly creamy. So I figured I could improve the texture by first running everything through a blender. This was try #3. The texture ended up better, but I was less impressed with the resulting color. It ended up more brown and less the desired dark blue / black. 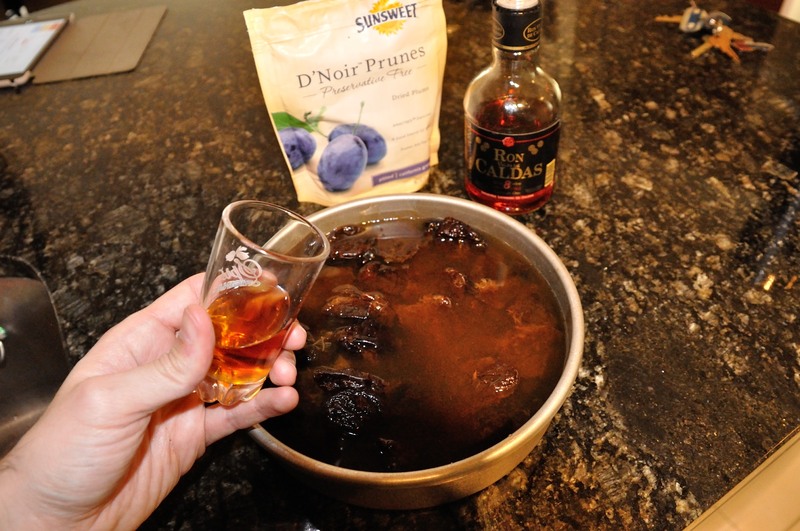 Start as before by soaking the prunes overnight, and then adding rum, vinegar, and sugar. I then ran everything through a blender. And bake just as before. 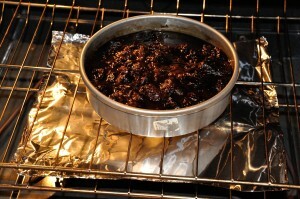 First use a hotter oven to bring the prune jam to boil, and then lower the heat to “simmer”. Don’t forget to stir. 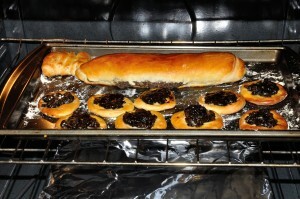 I continued baking until the jam got to the consistency shown in the second picture. 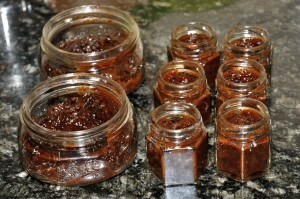 Finally, if you are making a lot of jam, and need it to last the whole year, you will need to preserve it. This is done by spooning the jam into mason jars, and then heating them fully covered in boiling water. This heating accomplishes two things: it kills off harmful bacteria, and provides an airtight seal that prevents new bacteria from getting in. 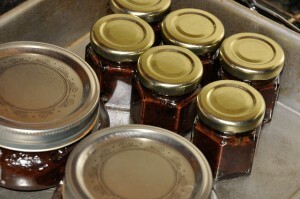 While the plum jam is baking, disinfect your mason jars and lids by boiling them in water with some dissolved vinegar. Next transfer the jam to the jars. Wipe off any jam from near the top. You should also try to eliminate any air bubbles, although I found this quite hard to do. I suspect the concern is that if these air bubbles escape from the jam, they could repressurize the volume, and release the lid. Screw on the lid and place in boiling hot water for at least 5 minutes to seal the jars. 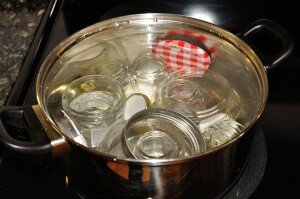 Then finally, use special canning thongs to carefully remove the jars from the hot water. And that’s it! It’s actually quite easy. We used this jam to make little thank you gifts for friends and family who have sent us Christmas cards. GREAT RECIPE! Thanks for sharing it with us. I, too, have a hard time finding plum jam (povidla) either in the U.S.A. or in the UK (although there are some Polish stores that sell them, but they are not particularly tasty). 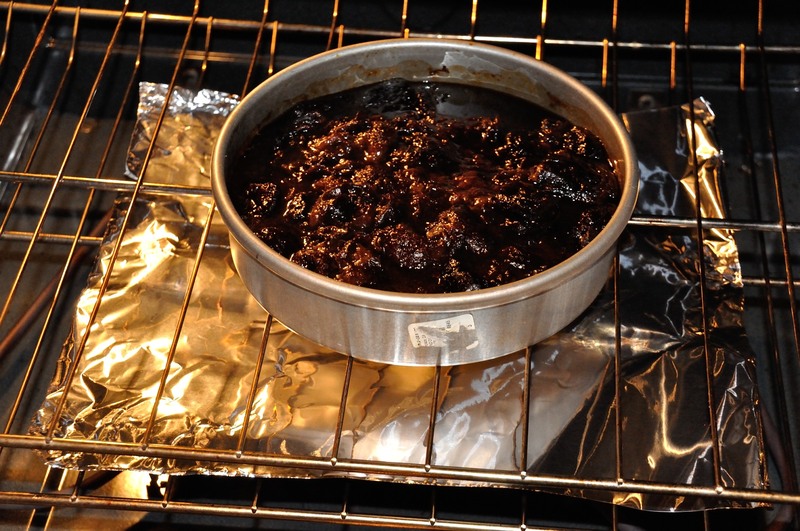 I was going to suggest to ‘bake’cook’ the prunes in a slow cooker. That would, of course, take longer then 3-4 hours, but it would a gentler way of cooking it. What do you think? By the way, I ♥ your recipes, they are wonderful and super delicious. Have a great day! Hi Ella, somebody else also mentioned the slow cooker. It definitely sounds like it would work. The only problem: I don’t have a slow cooker! Oops, I just woke up, saw the recipe and replied with several mistakes (missing words in the text, lol). Sorry about that, my apologies. If the plum jam to fill 96% alcohol, it can harden in the refrigerator of pectin. It turns jelly with 40% alcohol. In appearance your Gem, very similar Tkemali. By the way, a little-known fact. Slifovy sauce requires aging in the cellar, for about a year. Tkemali excellent seasoning for meat. Thank you for this site. I was born in Bratislava and came to Canada at 5 years old. Most of these recipes I have eaten and I was able to share them with my 90 year mother. She is still alive and had a great time knowing these recipes live on. God Bless. Luboš-0000000, for the inspiration and instructions! The colour comes from the fact that I used wild plums, rather than the beautiful damson plums, but the flavor was beautiful! I use open slow cooker. It works the best to leave it cook at low heat overnight. With high temp. 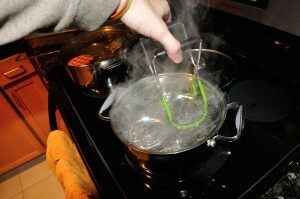 cooking, all alcohol from rum will be lost by evaporation. 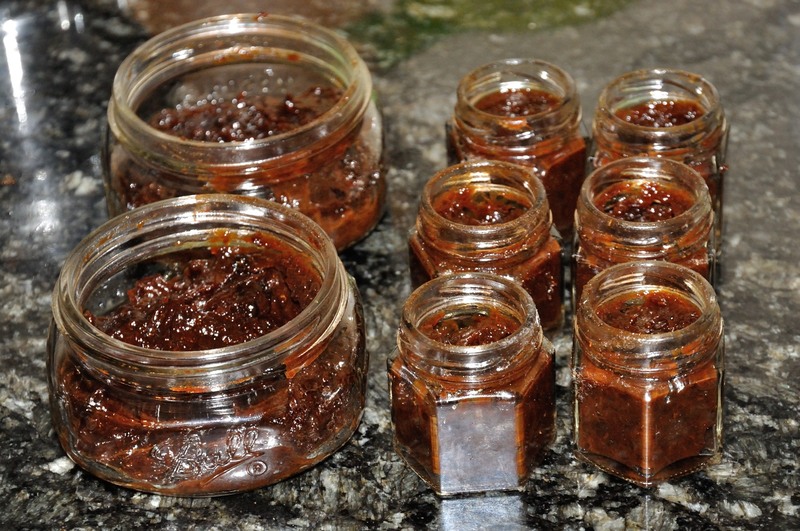 No need to remove bubbles from paste while canning. If can is capped properly when hot, it will create vacuum and no air can escape from the can. In fact, it is the vacuum which makes the can hard to open first time. 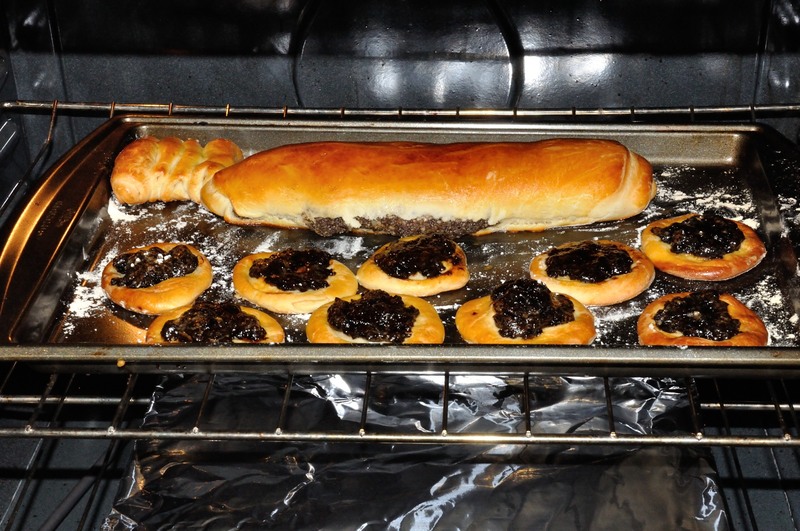 I made prune lekvar (not baked) with a recipe from the Pie and Pastry Bible by Rose Levy Berenbaum. 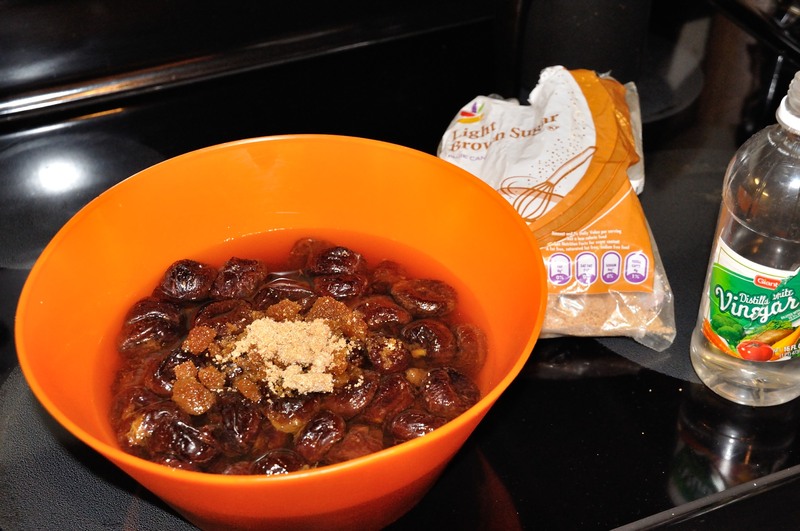 It calls for 450 grams dried, pitted prunes, 470 grams water, 50 grams sugar, a pinch of salt, the zest of one lemon. 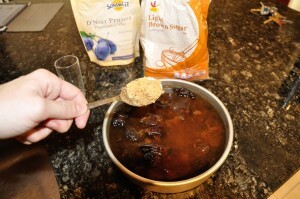 You soak the prunes in water to soften them, then simmer them in the water in a covered pan for 30 minutes. Then process in a food processor with the zest, sugar and salt until smooth. Put the mixture back in the pan and simmer and stir until you get the consistency you like. My born in Slovakia wife thought it was great and has used it in some of her pastries. She says when she was a girl in Slovakia most people just bought prune lekvar because it was so cheap, but people made their own lekvar from other fruits. Her parents used blueberries that they picked close to her home. I buy my lekvar on line. go to www,solofoods,com. Simon Fisher Lekvar Prune Butter comes in cases of 6 – 18oz. jars. gluten free. sugar added, try it, you’ll like it. 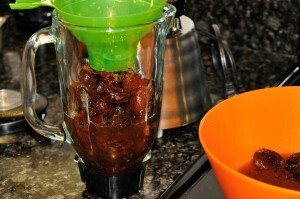 Secondly, I steamed prunes in my babycook steamer and it gave the most delicious sweet/sour plum puree. Perfect for all things slovak. I live in Dallas, and we at least get what they call “black” plums, but they’re really a very dark blue. All grocery stores have them. My Slovak grandmother in Cleveland had grape arbors and fruit trees in her backyard and my mother and aunts always made jellies and jams from the fruit, plus fruit pierogi and rolls. I never at any store-bought jelly or jam until I went away to college! I used to help my mother with the prep, but I’ve never made jelly or jam myself. I’m a pretty old lady now, and make this pretty much the same as I learned from my mother–which is quite similar to these instructions. Like my mother, I don’t accurately measure anything: the amount of sugar is adjusted by taste, and the rum is a good solid glug (again adjusted by taste). 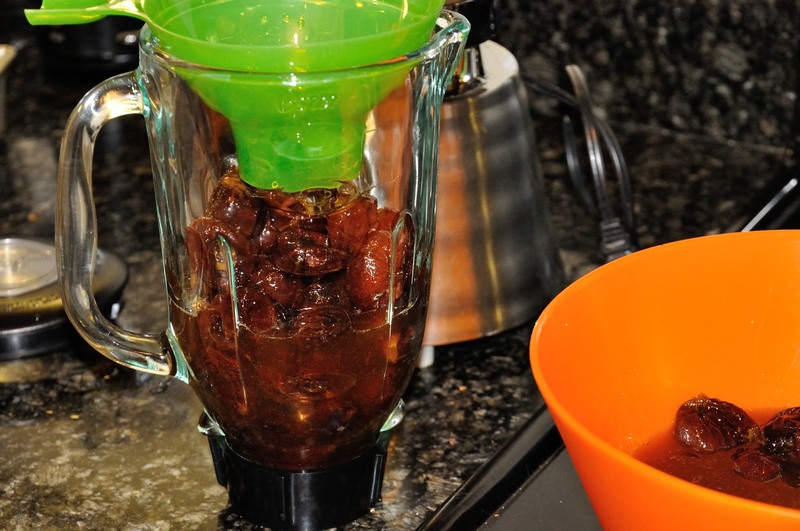 I try to find the black Italian plums that are available in my area for just a very short while and also add a bunch of chopped prunes to the mix, along with a lemon and lemon zest. 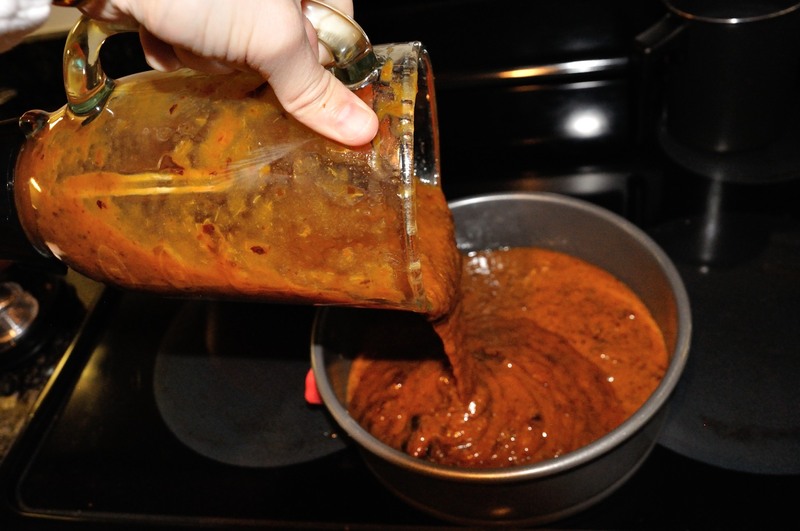 Something I do that my mother didn’t is to use an electric hand blender to puree the mix after it has cooked on top of the stove for a while and looks like it has thickened so that the texture is smooth. Then, it just continues cooking until I like the way it looks. After filling sterilized glass jars (from little jelly jars that I collect all winter), I let the jars sit until everything is cool before closing them up and storing them in the back of the refrigerator. Letting them store for a while really adds to the flavor. The black Italian plums produce a lovely deep plum color. If these are not available, I look for the smallest and darkest plums I can find. 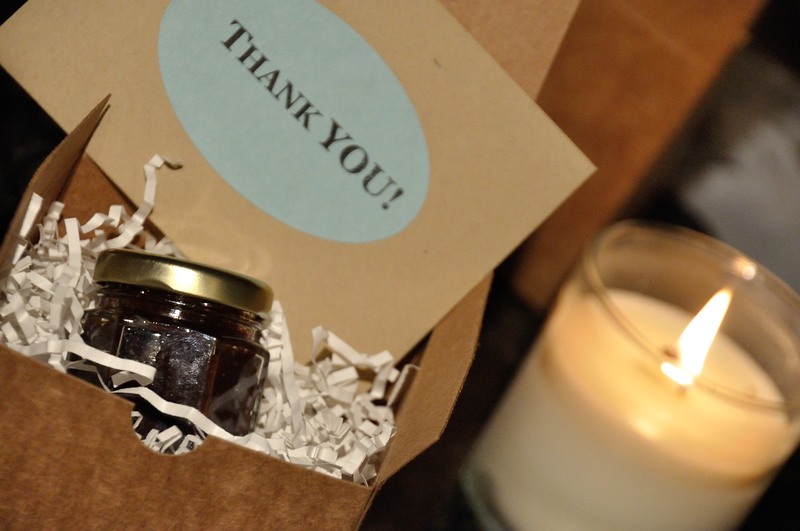 Every batch I make might be just a little different–but I’ve never had any complaints from anyone who was gifted with one of the jars.